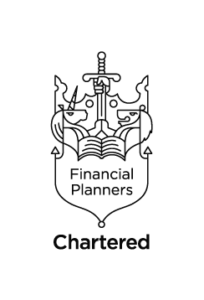 As a local business and employer, with owners who all live in Cranleigh, we take our corporate social responsibility very seriously. We make a real effort to support local organisations through sponsorship and active participation in different groups. Around this time last year, an opportunity arose to take over as chairman of Cranleigh in Bloom. 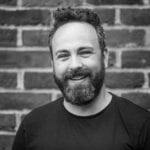 Taking on the role as chairman of this small committee, of which Andy was already a member, was a steep learning curve. I quickly had to understand the people, organisations, sponsors and processes involved in the initiative, in order to guarantee a smooth transition from the old leadership and ensure a successful year in 2016. Shortly after becoming chairman, I presented three main ambitions for Cranleigh in Bloom in 2016. These were to increase levels of planting in the High Street, encourage greater community involvement in the project, and submit a winning entry to the South & South East in Bloom competition. This week we have reflected on the success of Cranleigh in Bloom in 2016, as I attended the South & South East in Bloom Awards in Fareham and then hosted our own prize giving tea party in Cranleigh. We experienced a significant increase in planting this year. 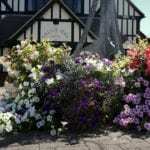 Local businesses have really embraced Cranleigh in Bloom, with more than 80 hanging baskets and 20 planted floral displays in troughs. As a result, Cranleigh High Street looked absolutely stunning throughout the summer. Another goal was to encourage greater community involvement in Cranleigh in Bloom. I firmly believe that local In Bloom initiatives need to be about much more than hanging baskets and floral displays; they also need to act as a focal point bringing together the entire community. There has been fantastic community involvement this year, something highlighted by the judges from South & South East in Bloom. We secured participation from the Cranleigh Community Group, Friends of Cranleigh Library, Cranleigh Arts Centre, Sure Start Children’s Centre, Rowleys Day Care Centre, and also the local primary schools, who will be performing a dramatic reading of poetry about where our food comes from at the Cranleigh Food & Music Festival on Saturday 24th September. Finally, we wanted to submit a winning entry to the South & South East in Bloom Awards 2016. These awards are part of the national Britain in Bloom competition, where boroughs, communities, residents and businesses can work together to improve their environment. 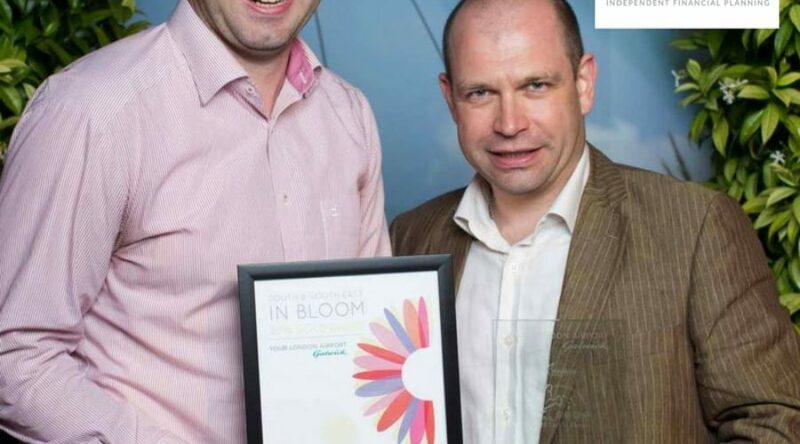 Cranleigh in Bloom entered South & South East in Bloom for the first time back in 2014, setting the bar incredibly high winning a Silver Gilt award in our first year. The previous committee then took a year off from the competition in 2015, before we submitted a new entry in 2016. Back in July, we welcomed to Cranleigh judges from South & South East in Bloom to show them the results of our hard work and answer what felt like hundreds of questions about our planting and future plans. On Wednesday afternoon, I was a guest at the South & South East in Bloom Awards 2016, in Fareham near Portsmouth, along with hundreds of representatives from other towns, villages and community groups. I am very pleased to report that Cranleigh in Bloom was awarded the highest standard, Gold, for our entry this year. 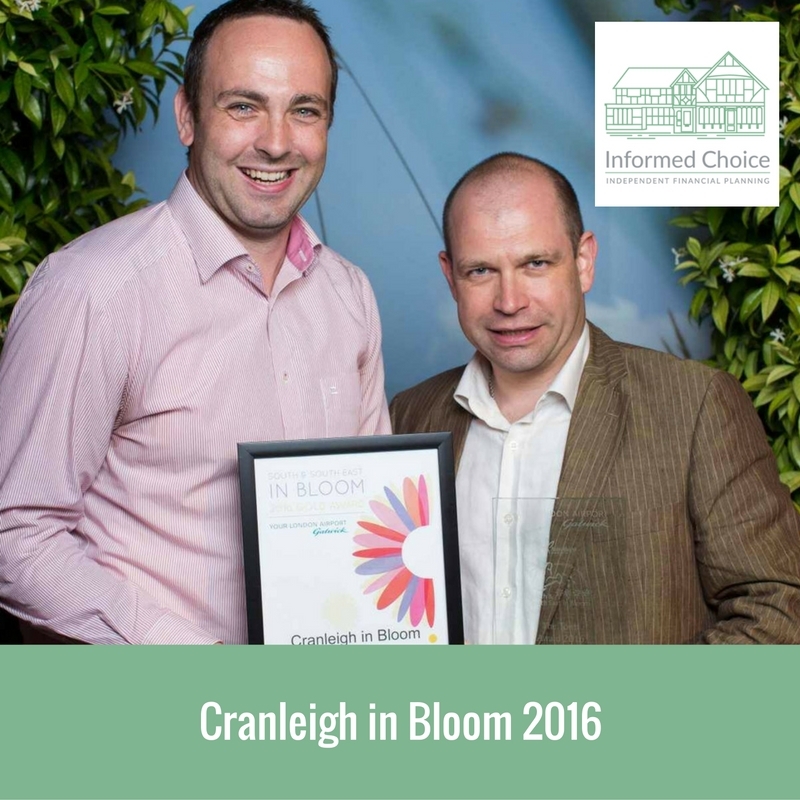 Not only that, but the Cranleigh in Bloom entry was the overall category winner, receiving The Town Award 2016 from South & South East in Bloom. Everyone involved with Cranleigh in Bloom is very proud of this achievement, which really puts Cranleigh on the map and is a fantastic reflection of the hard work put in by everyone involved in Cranleigh in Bloom this year. There is still some work to do before the winter to wrap up Cranleigh in Bloom 2016, but I am already looking forward to continuing to chair this important local organisation in 2017, and Andy can’t wait to continue support me in this role, spending countless hours on watering, weeding and making things happen for the local community.